The spider is widespread throughout much of Britain. It is widespread in western and central Europe. 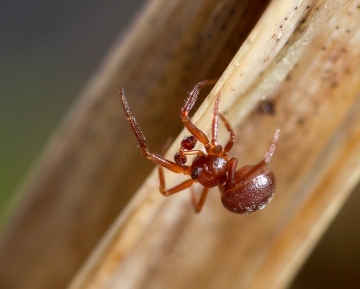 This species may be mistaken for a linyphiid spider due to its small size and dark colouration. However, the arrangement of its eyes is very characteristic. It is usually found at ground level amongst moss and detritus in a variety of habitats. It produces a typical theridiid scaffold web, about 20 mm in diameter. Sticky lines are attached to the ground for capturing crawling insects. Both sexes have been found throughout the year, with peaks in the spring and autumn/early winter. Generally a common species, which may be locally frequent.